Chris Mann was to Season 2 of The Voice what Javier Colon was in Season 1: that artist who was so good you had to stop and listen every time he performed, no matter who else you were pulling for in the competition. He is truly gifted, with impressive power, fantastic clarity, and the ability to convey so much emotion in every song. I am unashamed to say that he brought me to tears numerous times while he was on The Voice, because I was simply awestruck. Just shy of six months after he placed fourth on The Voice, Chris has released his first post-show album, Roads. The disc sounds and feels like it was put together over much longer than that. This is a beautiful album that deserves the listener’s full attention, because it ought to be experienced and not just heard. In that sense, it’s what music should be – not just the thing we put on while we’re doing something else, but the art form that we stop and enjoy. Wisely, the musical accompaniment is as unobtrusive as possible, so Chris’s voice is the focal point and shines through at every conceivable opportunity. Whether it’s a big moment or something much quieter, he’s equally as enchanting. His name has been mentioned in the same sentence as Josh Groban, but I’d make a distinction between the two: while both are amazing singers that I enjoy, listening to Josh Groban has never affected me in the way that listening to Chris Mann does. Roads is put together in such a way that it gives Chris the best possible showcase. The assortment of tracks is a great mix of songs which will appeal to the audience that discovered Chris on The Voice and original material to be enjoyed by new and old fans alike. Two of them, wisely put toward the end of the disc, are selections from the Season 2 live shows – “Ave Maria” and Coldplay’s “Viva la Vida.” Another track, “Falling,” first appeared on Chris’s 2011 self-titled release. While it respects the audience Chris gained from The Voice, Roads also stands on its own merits. In addition, the selection allows for Chris to show the full range of music that he can perform. His classical training is put to use on tracks like “Ave Maria” and “Cuore,” but he also handles country with a cover of Lady Antebellum’s “Need You Now” and excels on his version of Frank Sinatra’s “My Way,” which Paul Anka specifically rewrote for use on the album. He also reteams with his The Voice coach Christina Aguilera for the Damien Rice song “The Blower’s Daughter,” though the selection doesn’t allow them to harmonize together nearly enough. Regardless, it’s clear from the variety of tunes that Chris is not limited to just huge ballads or classical music – he’s as versatile as he is powerful. The only thing Roads doesn’t do is capture Chris’s wit and warmth, but otherwise it’s a close to perfect release. 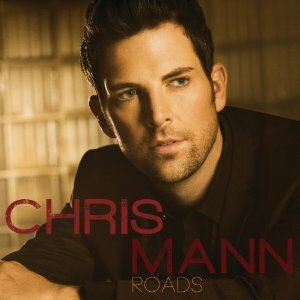 If you’re a fan of Chris Mann from The Voice, then Roads is an obvious addition to your music collection. Beyond that, however, it should also appeal to those who enjoy exceptional singers, because Chris has a voice that is strong, distinctive and with very few equals. The Voice brought him national attention, and with Roads, Chris Mann should establish himself as one of the most promising male vocalists in music. You can order your copy of Roads by clicking here. ← Happy Halloween from the Shields Brothers!